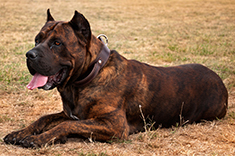 Also known as the Canary Dog the Presa canario is an extremly powerful dog with a strong muscular body. The powerful looking head is as wide as it is long. The nose and mask is black. The neck is broad, powerful and truncated. Some loose skin on the underside is typical. Loyal and powerful guard dog. 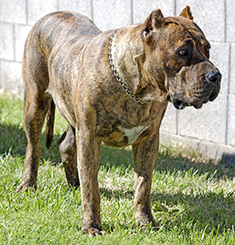 The Presa canario has a smooth coat that requires regular brushing. This dog breed is an average shedder. An excellent guard dog, the Presa Canario is distrustful of both strangers and other dogs, including his own breed. This breed is extremely loyal to its family and will not hesitate to attack anyone it perceives as a threat. Hip dysplasia can be a problem for the Presa Canario, so make sure breeding stock has been OFA certified. The Presa canario does best in warm climates and can do well in an urban environment. Requires daily exercise. Find Presa Canario Puppies with our Free Breeder search!